A straight fight between two nominations here and a close call for the win, not unlike the result of the winner here. In second place was a race that received a great deal of hype and cynicism in roughly equal measure. Poor promotion (ie none!) from the host circuit kept the crowds away and dreadful weather no doubt dissuaded others. They missed out on a race conducted beautifully by the organizers and competitors, with a fabulous spirit in the pitlane. The entry was interesting rather than stunning but there were stories aplenty - from the early demise of the much fancied Duller Motorsport BMW, through the astonishing road spec. Mercedes, to the famous win by Rollcentre’s Mosler MT900R – the Britcar 24 Hours grabs a very impressive second slot here in its debut year. 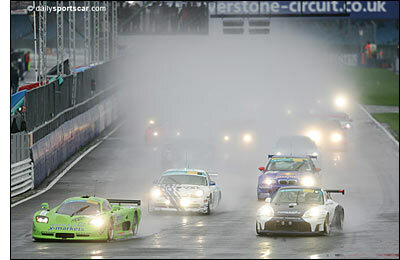 The winner is a race held at the same venue and with its own share of weather ‘issues’. Two very early safety cars nearly ruined the show (had it been a one hour race, it could easily have been judged the worst race of the year), but thereafter there was a fascinating game of racing chess, with tyre choice the key to a stunning finish - which saw Neil Cunningham grab a win, from the dominant Scuderia Ecosse Ferrari, on the very last lap, plus a scrap for second in GT3 between season long combatants Piers Masarati and Allan Simonsen GT3 which saw the Dane beat the Englishman by one thousandth of a second on the finish line! Fabulous stuff. 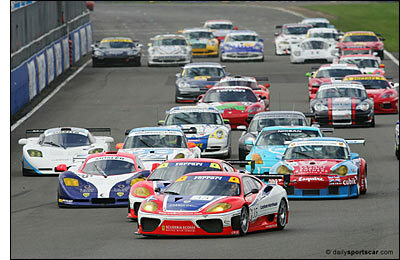 The dailysportscar.com United Kingdom Race of the Year 2005 is the British GT Championship 2 hours of Silverstone. “I cannot remember having to prevent myself from issuing expletives in a commentary box quite so often as in the two hours that this race took – great stuff.” Graham Goodwin.